Over the past 40 years, relationship marketing has emerged as the accepted paradigm of modern marketing. Essentially, relationship marketing strategies are based on the notion that it is better and cheaper to keep an existing customer than to expend effort on recruiting new ones. This implies a focus on the lifetime value of the customer rather than on the single transaction. In this article, we would like to explore the essence of relationship marketing strategies and investigate the differences between relationship marketing and transaction marketing. Customer retention has become increasingly recognized as the key to long-term success of companies. In the past, that was not the case. Most companies operated on a ‘leaky bucket’ basis, meaning that they were seeking to refill the bucket with new customers while ignoring the ones leaking away through the bottom of the bucket (leaky bucket theory). However, modern research has proven that customer retention is far more effective than trying to replace lost customers with new ones – which appears quite logical. Firms therefore need to recognize the importance of retaining customers over the long term. There are different relationship marketing strategies. For instance, loyal customers can be rewarded to ensure that they remain as customers of the company’s products. Traditional marketing is based on the idea of transaction marketing. That means, it is concerned with the exchanges between organizations and their customers. The result is a focus on producing products that satisfy consumers’ immediate needs. This in turn leads to a focus on the single transaction, and on acquiring new customers, either from the same market segment or from new ones. The inherent assumption is that customers who have bought once will naturally buy again, unless they are dissatisfied for some reason. With the emergence of relationship marketing strategies, this view changed: the focus now is on the lifetime value of the customer. The difference can best be explained using an example: a person might own 30 or more cars over a lifetime of driving, representing an expenditure of hundreds of thousands of pounds. Focusing only on the single transaction (transaction marketing) would neglect this lifetime value. The interest should, however, not only be in each individual transaction rather than in creating loyalty. Relationship marketing seeks to value the loyal customer ahead of the one-off deal, and seeks to build a loyal customer base over a long period. 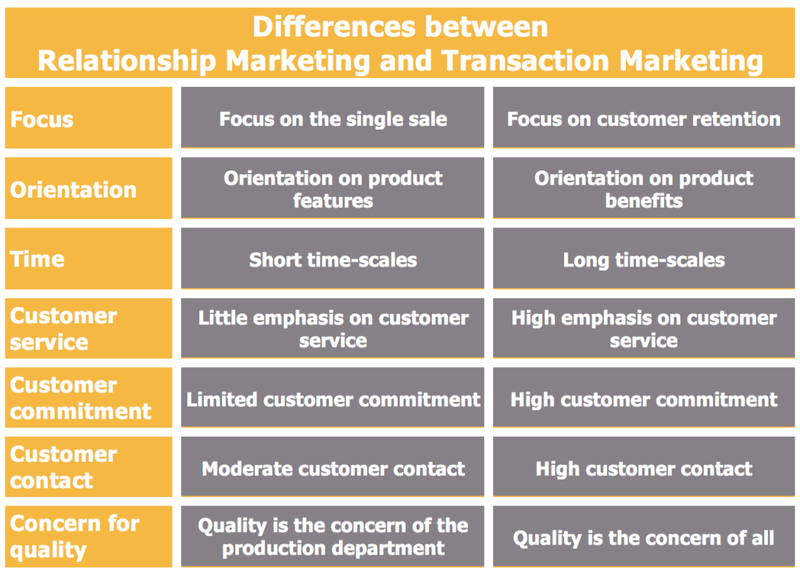 The differences between relationship marketing and transaction marketing are summarized in the table below.